Keiji Inafune produced Dead Rising, which is influenced by George Romero's Dawn of the Dead. 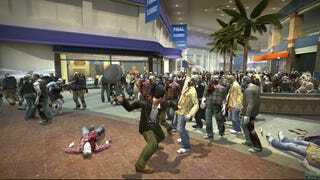 It wasn't just that classic horror flick that inspired the creation of Dead Rising. In a recent interview with Dengeki Online, Inafune says that it was Resident Evil 4 that sparked his desire to make a zombie game. During the development of Resident Evil 4, Inafune noticed that the "zombies", as he calls them, could run. "I thought, Mikami, what are you doing? Why are they running?" Mikami is Shinji Mikami, the creator of the Resident Evil franchise. "If I made my own," he recalls thinking, "there wouldn't be zombies like this." There is some debate, however, whether the "zombies" are actually zombies in the traditional sense as they have been infested with parasites. By comparison, Inafune's zombies in Dead Rising are the more traditional slow-moving zombies.